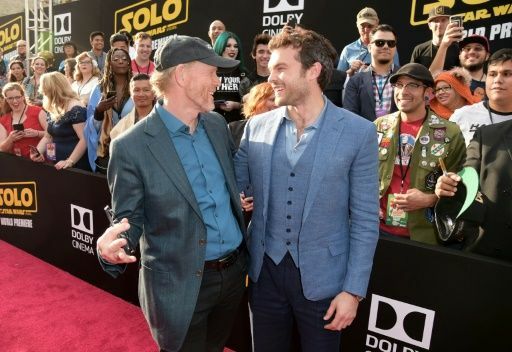 Oscar-winning filmmaker Ron Howard said Saturday directing a movie in the “Star Wars” universe was as daunting as making his Beatles documentary thanks to the intense fan love. “The level of anticipation is unlike anything that I’ve done. You fall into it and it’s amazing. It was a little bit like the Beatles documentary that I took on,” said Howard, who won directing and producing Oscars for “A Beautiful Mind” (2002). “Solo,” which gets its US release on May 25, charts the adventure-filled past of smuggler Han Solo — made famous in four “Star Wars” movies by Harrison Ford — before he was the galaxy’s most adored scoundrel. The second of three planned spin-offs from Disney-owned Lucasfilm, it follows “Rogue One: A Star Wars Story,” the second highest grossing movie worldwide in 2016. The latest episode sees Han meet his mighty future co-pilot Chewbacca and encounter the notorious gambler Lando Calrissian, in a journey that sets the course of one of the Star Wars saga’s most unlikely heroes. “It’s really wild. It’s really exciting and it’s bigger than you can wrap your head around. Particularly being in the Millennium Falcon, is very cool,” said Alden Ehrenreich, 28, who stars as the titular hero. Donald Glover, known to cool kids the world over as US rapper Childish Gambino, was the only name on Lucasfilm’s list to play Lando. The closest relationship Han has is with Chewbacca, played by six foot 10 inch (2.08-meter) Finnish basketballer Joonas Suotamo, who took over from Peter Mayhew, starting with “The Force Awakens” (2015). “This was a life-changer to me. I was borderline jobless when I got this role,” he said. The movie, which comes just five months after “Star Wars: The Last Jedi,” has endured a journey to screen that has been bumpier than the Millennium Falcon completing the Kessel Run. “Solo” was one of the first ideas Lucas — who sold Lucasfilm to Disney for $4 billion in 2012 — talked about when he outlined his plans for the spin-offs. Filming took place mostly at Pinewood Studios in Britain, as well as in the Dolomites mountain range in northeastern Italy and Fuertaventura, one of Spain’s Canary Islands. Neal Scanlan, who has been Oscar nominated for his creature work on “The Last Jedi” and “The Force Awakens,” was once again entrusted with populating the galaxy with its extraordinary array of aliens. His team produced over 500 designs for the creatures while visual effects supervisor Rob Bredow and his 1,200-plus artists oversaw 2,000 visual effects shots, creating all manner of otherworldly environments and spacecraft. “With the Millennium Falcon and the great sets, the approach is you’re trying to get as much in-camera as you can,” said Howard, who added that he was hoping for “as palpable and immersive” a movie as possible.